Guru’s Samadhi features a peaceful landscaped garden, open every day from 4.30am to 10.30pm for silent prayer and meditation. 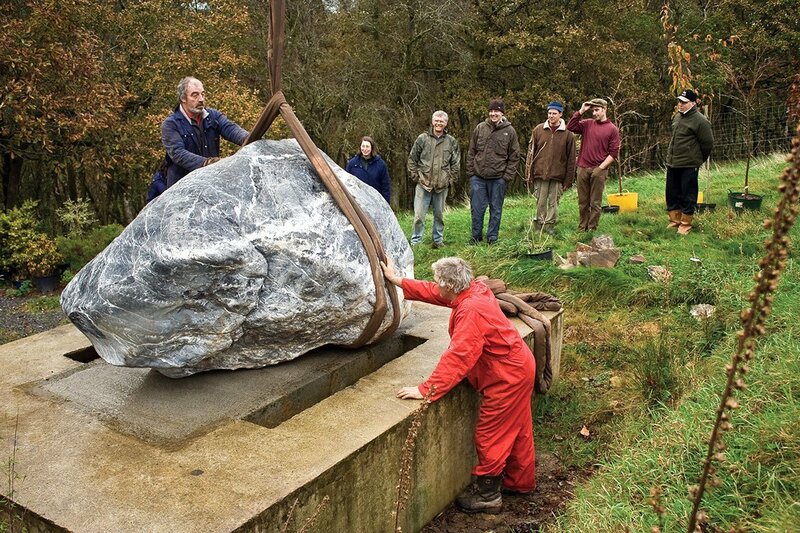 The focal point is a mighty 8-tonne shaligram installed on top of a stone plinth. This is where Guru Sri Subramanium, the founder of Skanda Vale is buried. We hold special mahabishekams at the Samadhi twice a year, on Guru Purnima and Guru’s birthday. Please have a look at the puja calendar for the dates of these two events. After Guru died in 2007, we had been trying to decide on a suitable structure for his Samadhi. We dreamt of elaborate golden domes and decorative wrought iron gates, with multi-faceted glass works and eternal flames, but nothing seemed quite right. Then, in Her own inimitable way, Divine Mother announced Her Will; a solution far more simple and graceful than we could ever have imagined. One of the Swamis was in Mother’s Gopuram, asking Her to guide and bless the design of the Samadhi, when in his mind’s eye, he clearly saw a huge shaligram, resting on top of the concrete plinth that forms Guru’s grave. A few days later, another Swami had a similar experience in the Sri Ranganatha Temple, with the conviction that this shaligram had to be found immediately. We were due to host a seminar in Switzerland later that week, so it was decided to begin the search there. 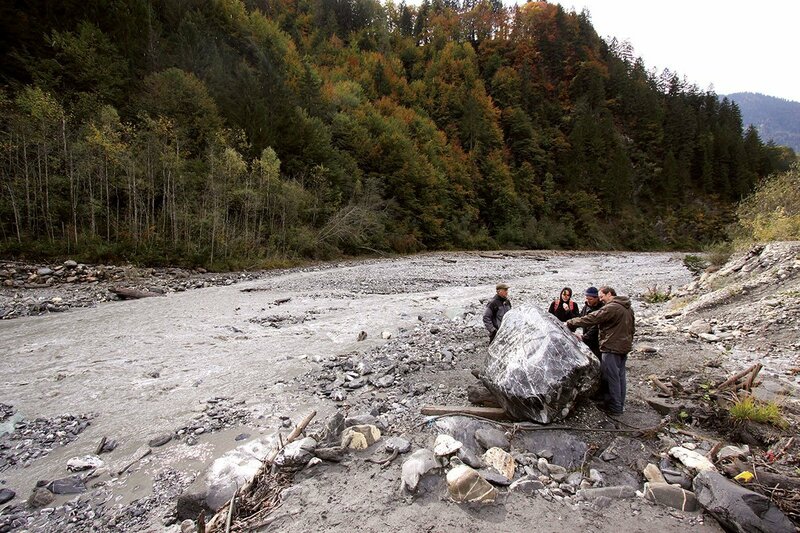 The first place we visited was the Schraubach river, close to Fideris, where our seminars are held. Unbelievably, at the base of an enormous concrete weir, barely concealed beneath a pile of driftwood, lay an enormous black shaligram! It had us spellbound, and exerted a curious magnetism, drawing everyone close in an aura of fascination, joy and reverence. Although it was unanimously decided that this was the one, out of curiosity we spent the rest of the day looking at other big rocks. But this only confirmed our conviction that we had already found what we were looking for. Nothing else could rival the unique warmth and vitality of the original. Arrangements with a local quarry were made, and the next day was set aside for excavation. It was difficult to guess the exact size of the shaligram, as it lay half submerged on the bank of the river. 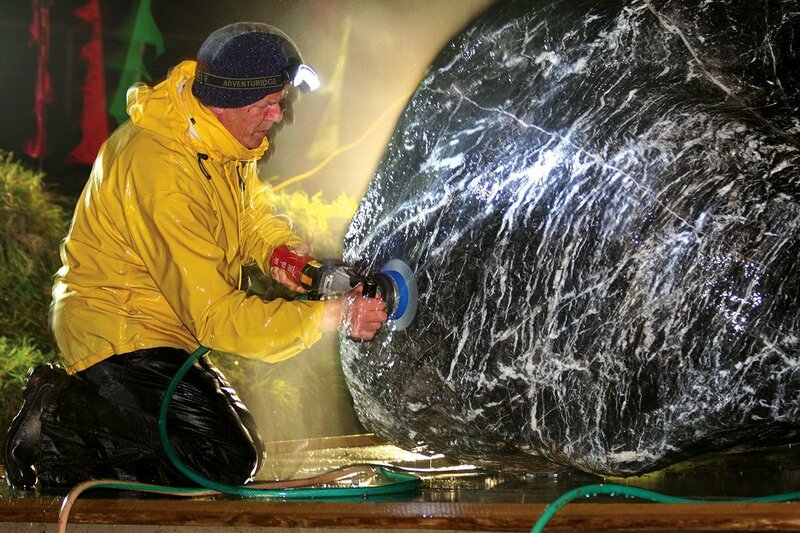 For hours we tried various ways of prying the rock from its niche, but it was deeply entrenched. On the final attempt, with an almighty heave, the shaligram popped out and almost tipped the digger over. It was enormous; an eight-tonne behemoth. It soon became clear that the shaligram eclipsed the need for any other building structure at the Samadhi. For thousands of years, it had been buffeted and honed by the river; we felt it’s power would be somehow undermined by enclosing it in a structure. The shaligram clearly needed to be in touch with the elements that had forged it. It’s interesting to note that if we had arrived a week earlier, (or later) we would not have found the shaligram at all. There had not been any rain for a long time, so the river was quite shallow, allowing its location to be revealed. 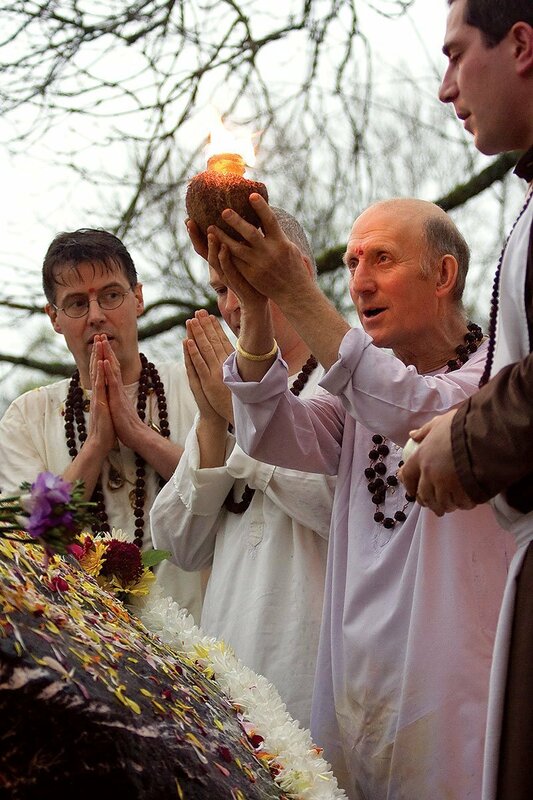 The shaligram was purchased from the quarry for £80, and was driven to the Samadhi site, where a crane hoisted it into position. We were all quite surprised to witness how perfectly (to within a few inches) it fitted the existing concrete plinth. Fortune, planning and providence had combined in even the smallest details of the project, giving us the feeling that all this was meant to be; that we were fulfilling roles in some preordained Divine leela. We now had just over a week to prepare the shaligram for its inauguration. Specialist stone polishing equipment was used to carefully clean all the impurities from its surface. As the muck and mud was removed, striking details began to emerge – delicate golden threads, fractal-like fissures and marbled swirls; like a miniature solar system encapsulated in stone. 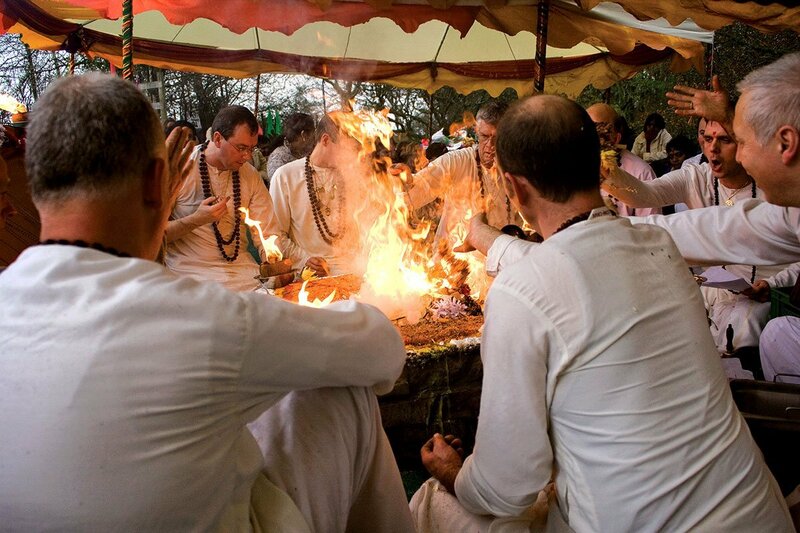 Whenever a new murthi, or image of the Divine arrives at Skanda Vale, we hold a yagam ceremony, in order to invite the power of God to reside in that form. 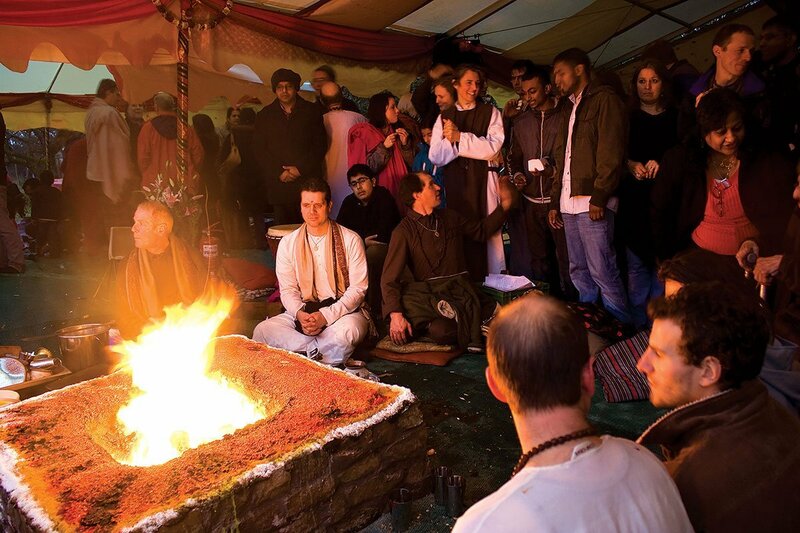 A yagam is an ancient ritual, in which a sacred fire forms the central focus of worship. Yagams are often used to displace any negative vibrations that may be lingering in an area, through dynamically drawing and restoring Divine power to a place or object. It is a form of worship that transcends the boundaries of religion and rekindles our connection with the Divine as manifested in the elements. 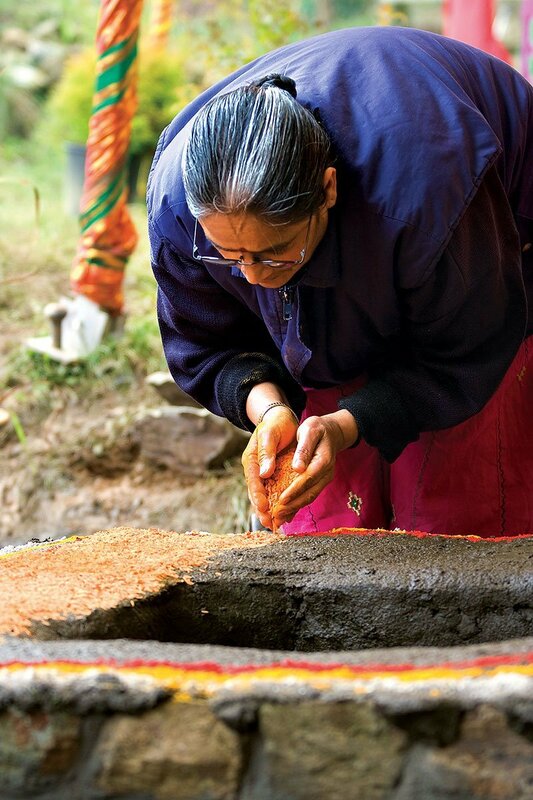 Auspicious ingredients are prepared as offerings to Lord Agni, the fire deity. 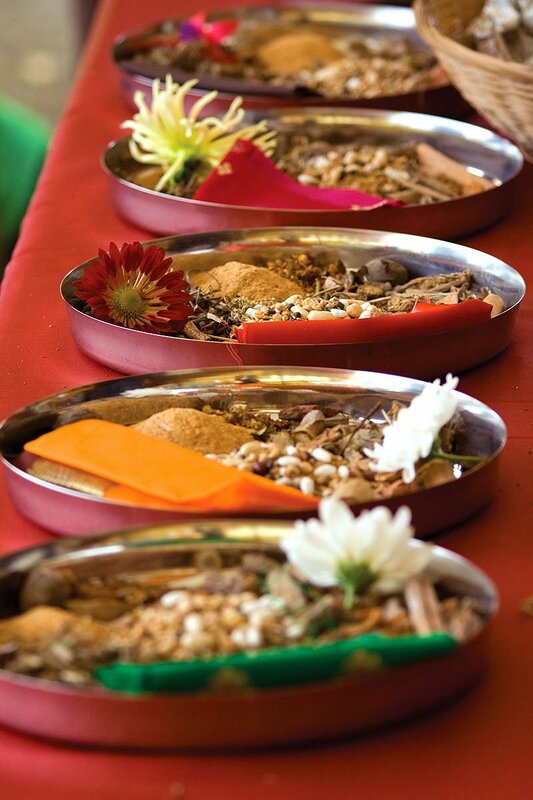 Many of these ingredients have been collected from the source of the Ganges and include various rare herbs, spices, fruits and leaves – all of which had been carefully selected and preserved for just such an occasion. 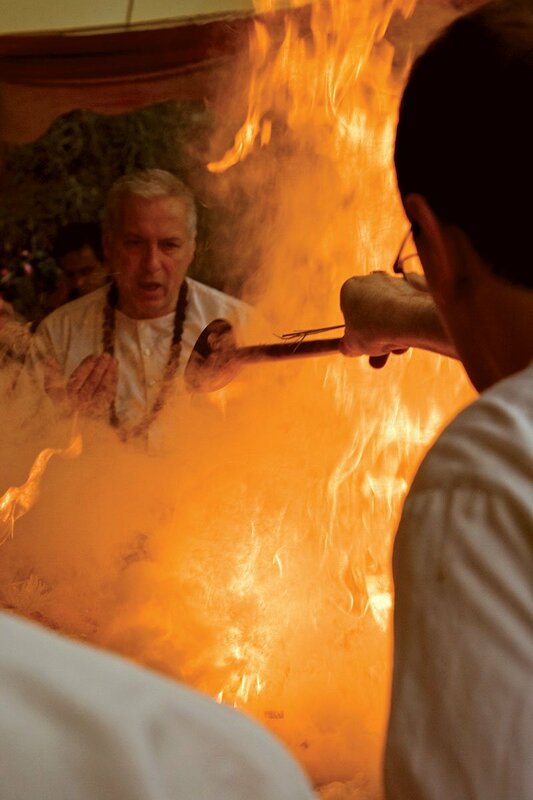 During the yagam ceremony, each ingredient is offered to the flame at a precise moment, in time with the chanting. 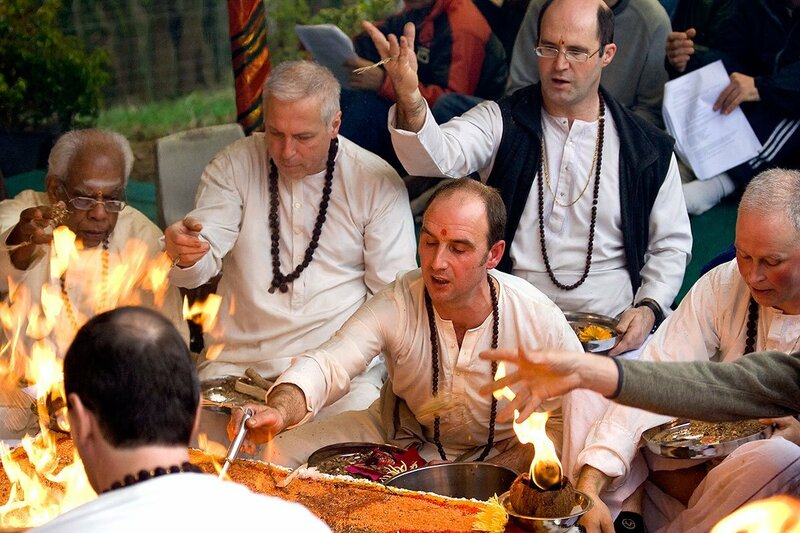 The intense concentration and devotion of the congregation generates a very high volume of energy in the yagam pit. It’s a sacred phenomenon that occurs only when you manage to rise above your everyday mind-set, through intense single-pointed focus. Whether you understand the intricacies of the ceremony or not, few can resist being captivated by the amazing spectacle of the fire, the beat of the drum, and the full-blooded passion of the chant. During the yagam, energy is transmitted to containers of water (mixed with special ingredients) via thin silver threads. The water is then poured over the shaligram, thereby consecrating it with the pure vibration of the yagam. 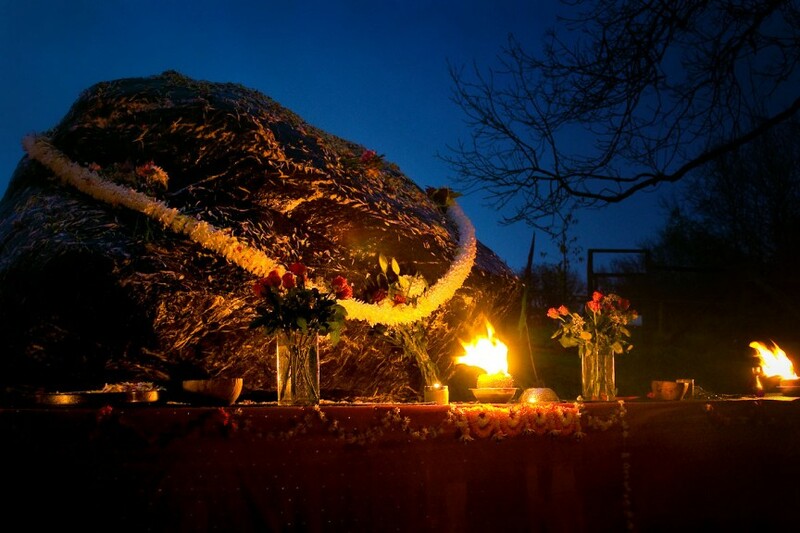 Finally, an enormous three-metre long garland of flowers is placed around the shaligram, and aarthi is offered. 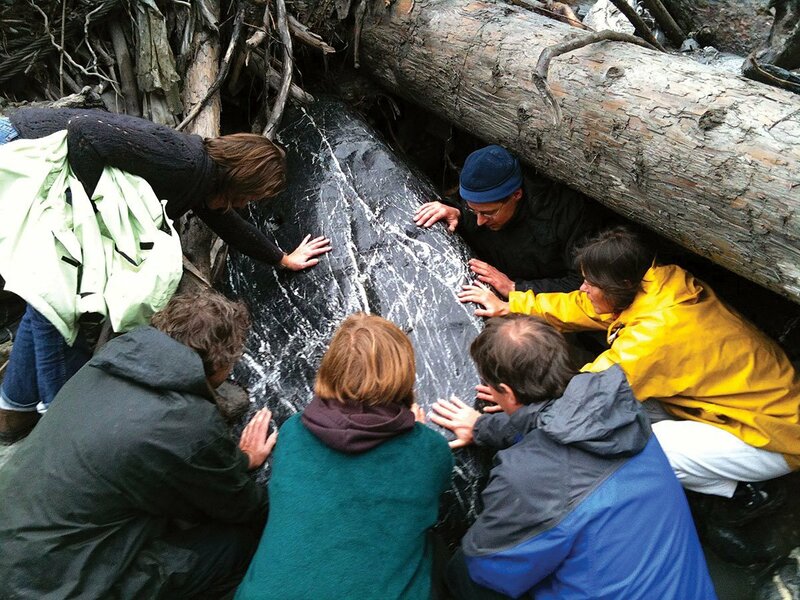 Guru’s Samadhi now has the feel of an ancient and powerful pilgrimage site, where you can become immersed in the formless nature of the Divine. If you make an effort to quiet your mind and tap into this power, you can begin to catch a glimpse of something truly vast – a realm beyond human thought and comprehension… The Infinite.